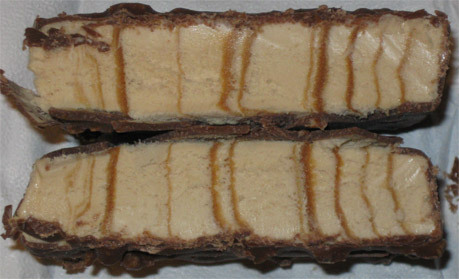 Oh, I had every intention of starting 2012 out healthy, I even have a freezer full of low octane treats, but then we had the back to back DQ reviews and some new stuff from B&J, and well, here we are now, finally digging into Klondike Caramel Pretzel... ummm, Klondikes. I would have reviewed these sooner but you just don't find them at very many places. I've seen these at one Walmart and... one Shaw's maybe. Not many places order them, but let's see if I can convince you to go find them. with a caramel swirl and coated with chocolate and pretzel bits. Looks pretty standard for a Klondike. I could totally pass this off as the Heath or Rocky Road Klondike bar. 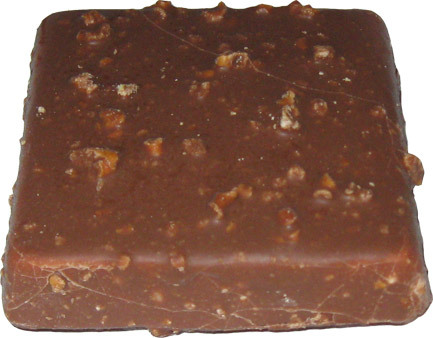 I'm really glad this picture came out because you can get a great view of how spread out the caramel is. Sure, that means you won't get a bite that super caramel-y (which I do enjoy from time to time), but it does mean that the flavor, though subtle, is in every bite. I'm so glad this wasn't just some lazy caramel injection in the middle of the treat. After the disappointing Rocky Road Klondikes, I was pretty sure Caramel Pretzel was just another gimmick, but thankfully, it is not. You've got a typical Klondike shape and eating experience, but the flavor is unlike any other Klondike. There's always that something something different about Klondike but it's not here. That familiar chocolate flavor is gone (or well buried). This treat is all about pretzels backed up with a delicate caramel push. The most surprisingly thing for me is that I totally wanted another one when I was done. I adore pretzels, and this treat does a nice job of bringing them to the treat without over doing it. There's just the right amount of pretzel crunch and flavor to go around. You know it's there, but you aren't slogging through it. There's a special place in my belly for consistent flavors, and they've worked it out here. Nice Job Klondike. These look really good; I'd definitely try them. These look amazingly good!! Would love to sink my teeth into one of them! house brand "Stone Ridge Creamery" still does if you can find it! Forgot to mention the delicious SALTY after taste!